There was a time when Big Ten football was simply just two powerhouses and the rest of the pack. From 1967 to 1983, either Michigan or Ohio State won the Big Ten title either outright or at least a share. The 10 year war ('69-'78) between Bo and Woody was an epic battle between two of the sport's most iconic legends. That scenario will never be repeated. 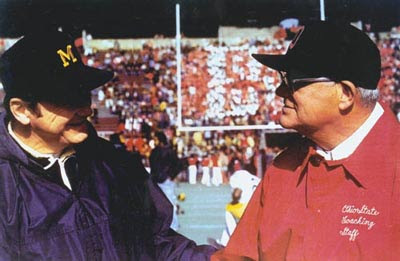 For as good as Brady Hoke and Urban Meyer are, their paths aren't nearly as intertwined as Bo and Woody's were. But a similar feeling is beginning to emerge as their respective schools are arming for an all-out war, that seemingly no other Big Ten school is able to assuage. It would seem that a clear separation between Ohio State and Michigan and the rest of the conference is at hand. Just look at recruiting. Brady Hoke has revitalized the talent pool that Michigan can choose from, bringing in some of the most talented prospects the school has seen in decades. And Urban Meyer has turned Ohio State quickly back into a destination for top-tier talent from all over the country. No one else is the league is even on the same playing field as these two schools when it comes to luring big-time talent. Now, of course I don't mean to say that no other Big Ten school has a shot. Crazy things happen all the time, injuries, bad-bounces, etc. But if anyone outside the league is looking at the Big Ten and wondering who's the big dogs, who else could it be? The Big Ten has taken it's lumps nationally in recent years, and for the bulk of the league, most schools are trending downwards. With Michigan State losing the bulk of their playmakers to the NFL, Beilema leaving for Arkansas and leaving many question marks at Wisconsin, and Penn State on a post-season ban for the next 4 years, who's left? Nebraska is hanging in there, but lags well behind in almost all the recruiting rankings for 2013. Purdue is rebuilding with a new coach, Northwestern is a viable option, but again, like most of the B1G, the incoming talent is just not there. Brady Hoke has surpassed his counterpart in East Lansing on the recruiting trail. Michigan notched the #5 recruiting class in the country according to Rivals.com. Michigan State came in at 39th, 5 spots behind 2014 Big Ten newcomer Maryland. In 2012, Michigan was ranked 7th overall, Ohio State 4th...and Michigan State 41st. A clear division within the state of Michigan alone is enough to turn the tide in the Wolverine's favor for years to come. Michigan has become a hotbed for recruiting nationally. Urban Meyer has been spotted north of the border a few times, trying to lure talent south to the snake pit. Now even I, true blue through and through, can see the value of having Urban looking over the fence into your back yard. We all know Brady Hoke has done likewise in Ohio. 2013 is going to be an interesting year for a few reasons. First, it could be the last year that Michigan and Ohio State are in separate divisions. Once Maryland and Rutgers come on board, and likely 2 more schools after that, the divisions will be realigned and renamed. There are a million scenarios out there, but the most logical ones place the two storied rivals in the same division. Competitive balance was the name of the game with Leaders and Legends the first time around. Now, it sounds like geographical balance will drive the divisions, like east-west or inner-outer. Either one puts Michigan and Ohio State in the same division. My take? Meh. As long as we still play every year, I'm indifferent. But I hope that doesn't mean Michigan State could skate out of the same division somehow. Then you have a protected crossover game for both schools and that just muddies the waters. Secondly, it may be the last time The Game falls on the last Saturday in November. This one I'm a little touchy on. With only a small handful of exceptions, Michigan and Ohio State have been playing the final game of the year for as long as I can remember...at least since the war. I'm not saying I'm not going to balk at this, but I'm not saying it either...you know what I'm saying? In this new and scary world of the rapidly expanding Big Ten, one fact remains a constant...anyone who wins the league other than Michigan or Ohio State will seem illegitimate. Funny how neither school has played in a Big Ten title game yet. Only two have been played so far, but still, it's something. That window of opportunity is closing for the rest of the league. And with Maryland and Rutgers...and two other yet-to-be-named schools coming on board soon, the middle of the pack in the league (Purdue, Northwestern, Illinois, Michigan State, Iowa), life is about to get that much more tougher. The B1G 2 are preparing for war. And it's on.